Department of Pharmacology, Faculty of Pharmacy, Universitas Indonesia, Depok,16424 West Java, INDONESIA. Eleutherinol is a naphtoquinone derivative that has strong affinity to bind with estrogen alpha receptors (ERα). This compound can be found in Dayak Onion Bulbs (Eleutherine bulbosa Mill.). The purpose of this study is to analyze the effects of Dayak Onion Bulbs extract on the growth of the bone of hypoestrogen model rat. A total of 36 female white rats of Sprague-Dawley were divided into 6 groups. All 6 groups receive CMC Na 0,5% (sham group), CMC Na 0,5% (negative group), tamoxifen (positive group), three level of dayak onion bulbs extract doses namely dose 8 mg/200 g, 12 mg/200 g, and 18 mg/200 g. All groups, except the sham, is ovariectomized to obtain the conditions of hypoestrogen. After ovariectomy, all rats were evaluated for the success of ovariectomy on day 35, followed by the administration of the extracts by oral administration for 21 days. After 21 days administration, the level of bone calcium, bone weight, and bone length were measured by Atomic Absorption Spectrophotometry. Dayak onion bulbs extract at dose 3 (18 mg/200 g BW) could increase significantly bone calcium level, bone weight, and bone legnth of hypoestrogen rat. The results showed that Dayak onion bulbs extract could be developed to be a drug for menopause woman in the future. Menopause is a condition of low estrogen hormone produced by the ovaries in the end of the menstrual cycle. Menopause occurs in women in the age range of 45 and 55 years old.1 (Muharam et al, 2017). Decreased levels of estrogen hormone in postmenopausal women will show some symptoms in various organs. Some of the symptoms that may arise can be classified into short-term symptoms and long-term symptoms. Short-term symptoms consist of vasomotor symptoms, psychological symptoms, urogenital symptoms, and symptoms on the skin. Meanwhile, long-term symptoms consist of osteoporosis, coronary heart disease, and atherosclerosis.2,3 (Geukes et al., 2012; Pacifici et al, 1991)). 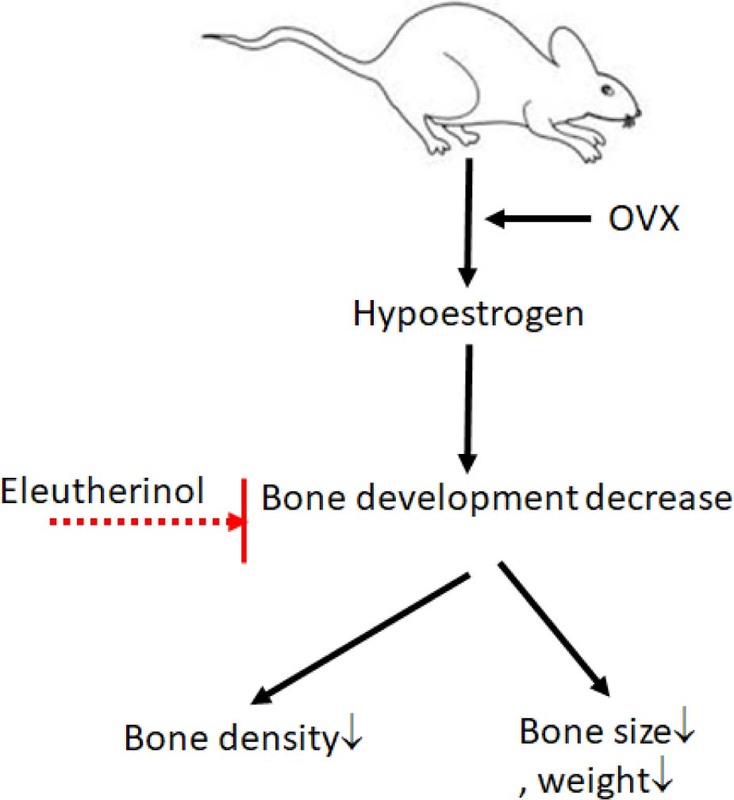 In pre-menopausal women, estrogen will suppress bone resorption, so at the time of post-menopause with decreased levels of estrogen hormone, an increase in osteoclast formation results from an increase in the number of cytokines such as Tumor Necrosis Factor Alpha (TNF-α). This condition will continuously lead to osteoporosis.4 (Santoro, 2005). Osteoporosis is a bone disease that characterized by the decreased of bone mass (bone density) as a whole due to the body’s inability to regulate mineral content in bone and accompanied by the damage of bone constituent components so resulting in bone loss. The cause of osteoporosis is the presence of disorders in bone metabolism. Bone metabolism may be impaired due to various factors, such as lack of estrogen, low intake of calcium and vitamin D, and side effects of some drugs.5 (Symposium, 2009; Reid, 2014). Various symptoms that arise after menopause can be overcome with the use of hormone replacement therapy (HRT). Hormone replacement therapy works as non-selective and agonist to all estrogen receptors, thus increasing the proliferation of all estrogen-receptor cells. With the technological advances in the field of genetic technology, found a class of drugs that work very unique, in some organs as agonists and in other organs estrogen antagonist (tissue-selective). This class is known as the selective estrogen receptor modulator (SERM). SERM drugs consist of 2 generations, namely tamoxifen (generation 1) and raloxifene (2nd generation). Tamoxifen is an agonist in the endometrium and bone, commonly used for the treatment of breast cancer and postmenopausal hormonal therapy. However, the effects of endometrial agonists on these drugs can lead to endometrial proliferation. Therefore, the second generation of raloxifene was found to be the same but antagonist to endometrium.6 (DuSell et al., 2008). The other treatment which is comes from plants and almost has the same activity as estrogen in the body called phytoestrogens. Phytoestrogens are molecules of plants that are structurally similar to endogenous estrogens. Phytoestrogens can directly bind to estrogen receptors (RE) and compete with endogenous estrogens, so they can have both estrogenic and anti-estrogenic effects. Phytoestrogens have these two properties and expected can be used as an alternative therapy for postmenopausal symptoms.7 (Pearce, 2003). One of the plants that containing compounds with estrogenic activity is the Dayak Onion Bulbs. Dayak onion bulbs is from Central Kalimantan.8 (Amelia, 2014). This plant comes from the family Iridaceae which is empirically used to cure breast cancer.9 (Bianchi, 1975). This is scientifically proved by In silico study in 2014 which states that Dayak onion bulbs contains derivatives of naftokuinon compound, eleutherinol, that antagonist in estrogen alpha receptors (ER-α) in breast.8 (Amelia et al., 2014). These compounds are expected selective and agonist in estrogen receptors in other tissues such as bone and blood vessels, so it can be used as an alternative therapy to treat postmenopausal syndrome. Therefore, further research is needed to prove the effects of Dayak onion bulbs scientifically on overcoming postmenopausal syndrome seen from the bone density by increasing levels of calcium, bone weight, and bone growth. Fresh bulbs were found and collected from Palu, Central Sulawesi, Indonesia and were identified by the Technical Service Unit of Biological Resources, Tadulako University, Central Sulawesi, Indonesia, with the voucher specimen number 65/UN.28.UPT-SDHS/LK/2016. The 70% ethanolic extract of dayak onion bulbs are made by maceration by 70% ethanol solvent. The 5 kg of dayak onion bulbs was soaked with 1 liter of 70% ethanol solvent for 24 h, stirring was carried out for 3 h and then the stirred extract was allowed to stand for 24 h. Furthermore, all the obtained maserates were evaporated with rotary evaporator at temperature of 50°C to obtain a viscous extract. All groups except sham group performed ovarian removal process (ovariectomy). Before being ovariectomized, rats were weighed, then anesthetized with ketamine 120mg / kg body weight of rat intramuscularly. After anesthetized, rats were scaled around the surgical area (right and left dorsolateral, ± 2 cm above the groin, with a distance of ± 1.5 cm from the spine of 2.5 cm2). Incision in the surgical area (slightly indented into the body if held or 2 cm following the spine with a distance of 1.5 cm from the spine). Look for the ovaries (shaped like grapes and under the colon) then cut and set aside. Apply betadine to open wounds, sew the skin in 1 knot and outer skin 2-3 knots, then apply an antiseptic solution. After that, apply betadin to the stitch area. The same procedure is repeated to take the right ovary. Single cage is prepared for each mouse, dialed with tissue and clean paper. Ovariectomized rats are placed in a single cage that has been prepared. Apply wounded rats with povidon iodin. Keep the cage clean. The tissue layer in the rat cage are replaced daily to maintain the cleanliness of the cage during rat recovery. Selection of dose and duration of treatment provision is based on the results of previous studies. Dayak onion bulbs extract dose 8 mg/200 g bw was set to be dose I, 12 mg/200 g bw was set to be dose II, and 18 mg/200 g bw was set to be dose III. Research was conducted using 36 female rats that were weighed and randomly divided into six treatment group of 6 rats as follows: sham, negative control, positive control, negative control, dose 1, dose 2, and dose 3 as shown in Table 1. Successively, all 6 groups receive CMC Na 0,5%, CMC Na 0,5%, tamoxifen, bawang dayak bulbs extract at a dose 8 mg/200 g bw, bawang dayak bulbs extract at a dose 12 mg/200 g bw, and bawang dayak bulbs extract at a dose 18 mg/200 g bw. All groups, except the sham, is ovariectomized to obtain the conditions of hypoestrogen. After ovariectomy, all rats checked for ovariectomy success on day 35, followed by the administration of the test substance orally for 21 days on day 36. After 21 days administration, measured level of bone calcium. At the end of the experiment, all experimental animals were sacrificed with ether to remove the left tibia bone. Surgery is performed using a surgical tool by cleansing bone from tissue and fat attached. Then, cut from the knee joints to the rat ankle joints.The preparation process of the bone’s sample that has been isolated is needed to be done first before doing the destruction process.The isolated bone was dried in a 100 °C oven for 3 h. After that, the bone is weighed. Then put it in a furnace with a temperature of 700°C for 4 h. Bones that have become white ash, crushed until smooth.The ash powder is then fed into the erlenmeyer flask and dissolved in 20 ml of 25% HCl, then the solution is heated over the hotplate until the 25% HCL volume is reduced to ¼ gourd. Furthermore, 10% HCl was added as much as 20 ml, then reheated until 10% HCl volume was reduced to ¼ fill, then put into a 50 ml measuring flask. After that, the aquadest is added to 50 ml on the measuring flask, then filtered.Pipette 1 ml of main solution, put into a 100 ml measuring flask, sufficient with aquadest to 100 ml. Subsequently the test solution measured its calcium content with an atomic absorption spectrophotometer at a wavelength of 422.7 nm. TLC of Dayak Onions extracts using mobile phase Chloroform:methanol (7:1). Black arrow indicated naphtoquinone. A. UV 256, B. UV 366, C. 10% KOH. The rat tibia bone is cleaned from tissue that attached and dried by oven at 100°C for 3 h. Furthermore, the bone is weighed using an analytical scale. After that, measured the length of each bone of each group. Data obtained from this work were analyzed statistically using SPSS. Analysis conducted were homogeneity (Levene test) and test of normal distribution (Shapiro-Wilk test). To see the relationship between the treatment groups, one-way analysis of variance (ANOVA) was conducted followed by an analysis of Significant Difference test (LSD). Differences between means will be considered significant at 5% level of significance i.e P<0.05. Dayak onion bulbs were extracted in the Research Institute of Spices and Medicinal Plants of Indonesia by using maceration method. Fresh of bulbs as much as 5000 g yield 70% ethanolic extract of dayak onion bulbs as much as 188,7 g or has 3,77% of rendemen. By phytochemistry screening, the 70% Ethanolic extract of of Dayak onion bulbs contains : flavonoids, tannins, alkaloids, saponins, triterpenoids, and quinones. 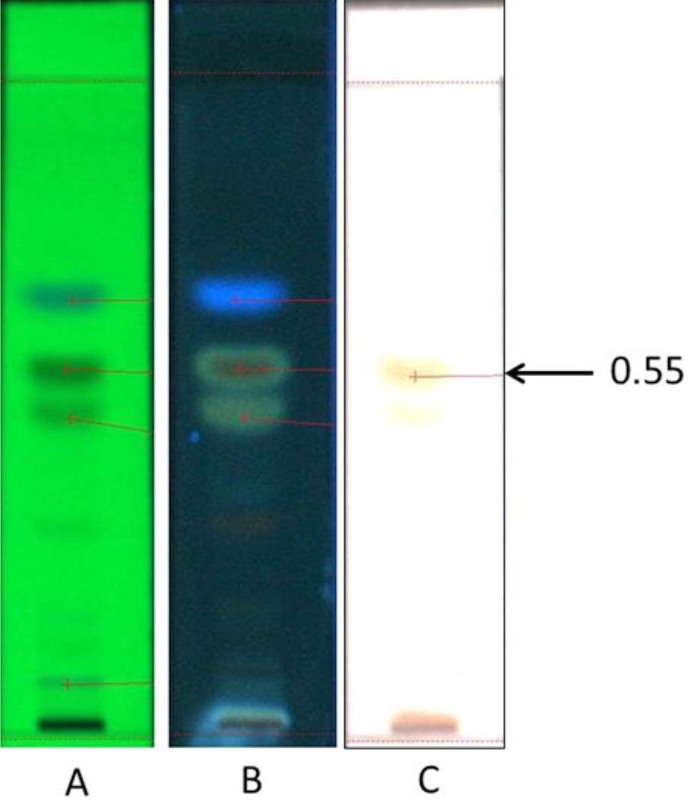 We also identified naphtoquinone content of the extract by thin layer chromatography and found that spot for naphtoquinone on the Rf 0.83 similar with the previous research as shown in Figure 1. At the end of the treatment, all the rats in each group were sacrificed and removed their left tibia bone to determine the bone calcium level. The bone samples were measured by an atomic absorption spectrophotometer at a wavelength of 422.7 nm, and then the results can be seen in Table 3. At the end of treatment, after cleansing of the attached tissue, the rat’s tibia bone was dried at 100°C for 3 h. After that, the bone is weighed with analytic scales. The results of bone weight measurements can be seen in Table 3. Tibia rat length measurements were performed after the weight of the bone was weighed. The results of rat bone tibia length measurement can be seen in Table 3. Dayak onion bulbs were extracted in the Research Institute of Spices and Medicinal Plants by using maceration method because its simple, safe, and does not change the compounds contained. In previous study it is known that eleutherinol compounds can be drawn using methanol solvents (polarity 5,1).10 (Gallo et al., 2010). Thus, in this study we used solvent with polarity approaching methanol which is 70% ethanol (polarity 5,2). The choice of ethanol as a solvent is also based on the polar properties of ethanol so it is expected to attract the desired compounds, and also in terms of safety for animals and humans. The 70% Ethanolic extract of of Dayak onion bulbs contains flavonoids, tannins, alkaloids, saponins, steroids / triterpenoids, and quinones. Flavonoid evaluation was done using Shinoda test by addition of Magnesium powder and 1 ml of concentrated HCl. Furthermore, amyl alcohol was added, shaken with strength, and allowed to separate. The final result is the formation of red or orange yellow color that indicates the presence of flavonoids. Identification of tannin using reaction with 1% FeCl3 solution and resulted in a blackish-green color in the extract indicating the presence of a condensed tannin. The addition of FeCl3 may react with one of the hydroxyl groups on the tannin. Dayak onion bulbs extracts also positively contain saponins as indicated by the formation of foam during identification. This shows the presence of compounds that have the ability to form foam in water that hydrolyzed into glucose and other compounds. For alkaloid identification, dayak onion bulbs extracts gave positive results when the Mayer reagents were added, white precipitate was formed. Then, with bouchardat reagent, dayak onion bulbs extract gave positive results by the formation of brown precipitate, and the Dragendorf reagent characterized by the formation of orange precipitate. Identify triterpenoids / steroids using Lieberman-Burchard reagents. Filtrate of dayak onion bulbs extract was added by Lieberman-Burchard reagent and yielded a red precipitate then turned into a blue green indicating the presence of triterpenoids / steroids. For the identification of the quinone, filtrate of dayak onion bulbs extracts were added 5% sodium hydroxide and resulted in a positive red color. Qualitative analysis of Dayak onion bulbs extract. According to the Table 2, the average of bone calcium levels from highest to lowest is the third dose, dose 2, sham, positive control, a dose of 1, and a negative control. The average of bone calcium levels with dose variation showed that there was a difference between dose group 1, 2 and 3. Statistical analysis showed that there was no significant difference between dose groups 1 and dose groups 2, but there are significant differences between the groups with a dose 1 and dose 3. There was no significant difference between bone calcium level dose group 2 with group Dose 3. Based on Table 2 above, the average bone weight from highest to lowest is dose 3, dose 2, sham, positive control, dose 1, and negative control. The average tibial bone of the sham group is much greater than the negative control group. This is evidenced by using statistical tests showing a significant difference between the weight of tibia bones of the sham group and the negative control group. This indicates that the process of ovariectomy is successful and those rats are actually in a hypoestrogen state. Estrogen plays a role in bone growth and inhibits osteoclast activity through osteoprotegerin stimulation. Low estrogen levels cause increased osteoclast activity resulting in reduced bone matrix, calcium bone and phosphate deposits also decreased. The average tibia bone weight of the positive control group was much greater than the negative control group. This is evidenced by using statistical tests showing a significant difference between the positive control group and the negative control group. Furthermore, statistical analysis showed no significant difference between the tibial bone weight of the positive control group and the dose groups 1 and 2. However, there was a significant difference between the tibial bone weight of the positive control group and the dose group 3. This indicated that dose 3 could significantly increased tibial bone weight. The high bone weight of the tibia in the group that received the treatment of the dose 3 extract (18 mg / 200 g BB) showed that with the increase of the dosage of extracts, the bone mass increased. Bone matrix consists of organic elements, namely collagen fibers and inorganic elements which constitute two thirds of the weight of the bone. The inorganic element comprises calcium phosphate salts (85%), calcium carbonate (10%), and small amounts of calcium fluoride and magnesium chloride. Thus, the greater the bone, the greater the calcium content in bone. Based on Table 2, the sequence values of the average bone length from highest to lowest were dose 3, dose 2 and sham, positive control, dose 1, and negative control.The average length of bone with those three dose variations in the extract dose treatment group showed that there was a difference. The result of statistical test showed that there was no significant difference between group of dose 1 and group of dose 2, but there was a significant difference between dose group 1 and group dose 3. There was no significant difference from statistic test of bone length of group dose 2 to group dose 3. The average bone length of the positive control group was much greater than the negative control group. This is evidenced by using statistical tests showing a significant difference between the positive control group and the negative control group. Furthermore, statistical analysis showed no significant difference between the bone length of the positive control group and the dose groups 1 and 2. However, there was a significant difference between the bone length of the positive control group and the dose group 3. This suggests that dose 3 may increase the length Bone significantly. The high bone length in the group that received the treatment of 3 dose extract (18 mg / 200 g BB) showed that with increasing dosage of extract hence increase of tibia bone length size. Based on the research that has been done, it can be concluded that the 70% ethanolic extract of dayak onion bulbs has an effect on bone density. It can be seen from the increase of the calcium, weight and the growth of the bone. The best effect was obtained from dose 3 (suspension of Dayak bulb extract 18mg / 200g BB) seen from density parameter and bone growth. We thank tp Directorate of Research and Community Service, Universitas Indonesia who gives financial support this research. Anton Bahtiar: Obtained his Ph. D. degree in 2010 from Nara Institute of Science and Technology, Japan. 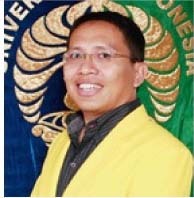 Currently, He is lecturer and researcher at faculty of pharmacy, University of Indonesia since 1998. He is also a head of Pharmacology and Toxicology Laboratory. His research projects are focus on Herbal medicine, and tried to solve the mechanism of action of herbal medicine, especially for osteoporosis and menopouse. Muharam R, Setiawan MW, Ikhsan M, Rizkinya HE, Sumapraja K , authors. Depression and its link to other symptoms in menopausal transition. Middle East Fertility Society Journal. 2017. https://doi.org/https://doi.org/10.1016/j.mefs.2017.08.003. Geukes M, Aalst MP, Nauta MCE, Oosterhof H , authors. The impact of menopausal symptoms on work ability. Menopause: The Journal of The North American Menopause Society. 2012. 19(3):p. 278–82. https://doi.org/10.1097/gme.0b013e31822ddc97. Santoro N , author. The menopausal transition. The American Journal of Medicine. 2005. 118(Suppl12):p. 8–13. https://doi.org/10.1016/j.amjmed.2005.09.008. Symposium CF , author. Bone Structure and Metabolism. Novartis Foundation Symposia Hoboken: Wiley. Retrieved from 2009. http://ncl.eblib.com/patron/FullRecord.aspx?p=739059. Pearce V, Nawaz Z, Xiao W, Wiedenfeld D, Boyle N, Smith D , authors. 4-Ethoxymethylphenol: A novel phytoestrogen that acts as an agonist for human estrogen receptors. Journal of Steroid Biochemistry and Molecular Biology. 2003. 84(4):p. 431–9. https://doi.org/10.1016/S0960-0760(03)00064-5. Bianchi C, Ceriotti G , authors. Chemical and pharmacological investigations of constituents of Eleutherine bulbosa (Miller) Urb. (Iridaceae). Journal of Pharmaceutical Sciences. 1975. 64(8):p. 1305–8. https://doi.org/10.1002/jps.2600640809.